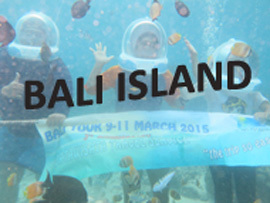 We will bring you around to the second largest city in Indonesia. Labeled "City of Heroes", a lot of interesting places to visit, both in terms of history, culinary or from the side of modernity. Pick up/meet at the airport/railway station/departing from the agreed location, our guides will accompany you on your tour (Snack & welcome drink). The first object to Surabaya Zoo for a photo in front of the Icon Surabaya, Suro and Boyo (Shark and Crocodile). Then we turn not far from Icon Suro and Boyo us to Bungkul Park, this park has a variety of facilities that make the visitors comfort, Bungkul Park was awarded as the best park in Asia given by the United Nations (UNO) on 26 November 2013 in Japan. Next to the Submarine Monument (Monkasel), you can enter spaces in the Russian-made submarine-art at the time. It is a submarine that was once used Indonesia for security operations in Indonesia. After that go to TUGU PAHLAWAN, which is a symbol of the city of Surabaya. In this place there is the Museum of Struggle, we can feel the atmosphere of the past Surabaya during the struggle for independence, there are also agents of history and combat equipment used. Lunch at a nearby restaurant (optional), to the House of Sampoerna, which is a museum of the development cigarettes. By late afternoon we will visit BATIK Shop, can also visit PLAZA / modern MALL located in Surabaya. 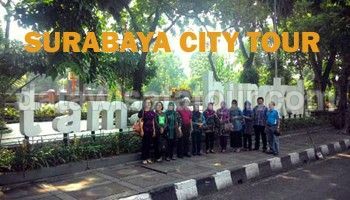 Having satisfied our shop will be among you to where you want to go in the city of Surabaya, and it's done us a series of activities with DATAWISATA TOUR & TRAVEL and we wait for your next trip. after tour above, you can visit / traverse BRIDGE SURAMADU. The bridge that connects between Java and Madura Island which is the longest bridge in Indonesia today. Dinner can also at Restaurant in Madura island (optional). Transport with AC. Guide driver, fuel, tolls, parking. Snack & mineral water, Entrance ticket.